Those who have visited Belgium’s Capitol have probably noticed an intriguing sign which often hangs in local cafés and bars. 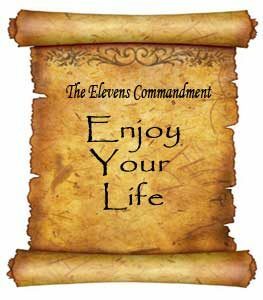 The sign says: “The Eleventh Commandment: Enjoy your life.” What is this? A slick marketing trick designed to make visitors spend more, or a truly important reminder? So important that it can be associated with the Ten Commandments of Jesus Christ? Before I answer this question, let me tell you an interesting scientific fact. German psychologists who’ve worked with children enduring the latest stage of cancer, decided to conduct an unusual experiment. They chose to fulfill the children’s most sacred desire in order to see how it affected their wellbeing. They picked several terminally ill kids who were expected to die soon. So, what were their wishes? One little four year old girl who lived in a small village wanted to ride a big city tram. An 11 year old boy dreamt about horseback riding and another 13 year old girl envisioned herself as a princess. She wanted to have servants and people who would kiss her hand as they would with a real princess. The psychologists rented a tram and drove the little girl around the city for two hours. They showed her interesting places and treated her with tea and sweets. Then the psychologists found a couple of horses for the boy and his father and they went galloping along the coast. The most difficult wish to fulfill was the transformation of the young girl into a princess. But they found the solution: they rented an old castle and borrowed some beautiful vintage clothing. The doctors dressed as courtiers and the girl wore a princess’ dress. The little princess strolled around the castle and everybody served her, and just like she dreamt about, kissed her hands. Medical tests conducted later yielded some astonishing results. One child’s cancer completely disappeared; other’s went into a remission, or at least their cancer halted its progress. This experiment confirmed the truth that was known to ancient healers, but which modern doctors often forget: our emotions have a strong and direct influence on our health and wellbeing. Positive emotions and thoughts are capable not only of bringing joy and happiness, but can also heal the most serious illness. This is why the phrase “enjoy your life” is not a joke, but a very profound truth. “Man is born for happiness as a bird is born to fly.” This saying by a Russian writer named Vladimir Korolenko is known by most of Russians. These are the words of an optimist. A pessimistic Russian poet named George Ivanov turned the famous saying into a joke: “Man is born for happiness like a bird for pate.” If we divide humanity to optimists and pessimists, for each optimist there will be approximately three pessimists. There is a scientific explanation to this equation. 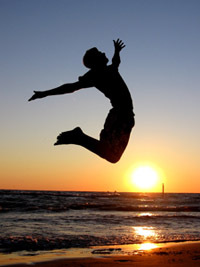 Scientists claim that it’s more difficult to stimulate positive emotions than negative ones. As it turns out, a human brain is evolutionarily programmed to concentrate on any external signals which warn about danger. This also means that we notice “bad things” easier and faster than “good things.” Also, we hope for the best, but are conditioned to expect the worst. We waste an enormous amount of life energy on useless, irrational fears, anxiety and worries. As a result, we unintentionally damage our own health. Premature aging, hypertonia, ulcers, strokes, heart attacks, cancer – these are just some of the side effects we experience with sad, worrisome, fearful and evil thoughts. They poison our bodies in a very real, physical way hour-after-hour and day-after-day. Conversely, kind, joyful and optimistic thoughts can not only improve our health, but may also conquer disease. “Correction of psyche” can be translated as changing from negative thinking to positive thinking. If we were to express the secret of health in just few words, we could say: “Think about good stuff!” In one word, enjoy! Because it’s not “from healthy body to healthy spirit,” but rather from healthy spirit to healthy body. “My story starts in March of 1981. I will never forget that day. My plane crashed and I ended up in a hospital, completely paralyzed. Several of my vertebrae were broken, I lost the swallowing reflex and I could only blink my eyes. Doctors said that I will be a vegetable until the rest of my life. But it didn’t matter to me what they thought, the main thing was what I thought. And I had no intention of becoming a vegetable. Pointing with my eyes to the letters of alphabet I created a note: “I will walk by next Christmas.” I imagined myself walking again and again; I saw myself as a normal person, walking out of the hospital on my own feet. “While you have a mind, you can fix everything else,” I told myself. I was hooked to a breathing machine and they told me that I will always be dependent on it because the part of my brain responsible for breathing is destroyed. Even that didn’t stop me. “Incurable is treatable from inside,” emphasized the movie’s creators. And they came to conclusion: those who want to be sick will be sick, and those who want to be healthy, will be healthy. 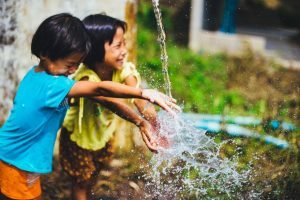 American professor Richard Wiseman, who studied the psychology of optimism and success for many years, claims that happy people have several common traits. And the most dangerous trait according to Wiseman is low self-esteem. This is the marker of an unhappy person. Lack of love for yourself forces people with low self-esteem to constantly worry what other people think or say about them. Other people’s opinion is more important for them than their own. Therefore, their happiness is always under threat, always elusive because its source is contained in somebody else’s head. Once upon a time, a man came to a sage. He complained that no matter how many good deeds he does for others, they don’t reciprocate and he doesn’t feel any joy. I am an unhappy loser, sighed the man. In your virtues, said the sage, you resemble a beggar who wants to please everybody he meets, giving away things he himself needs. That’s why there is no joy in them from your gifts and in you from your sacrifices. That’s why your travel bag is empty. This is the source of your bad luck. Here is my advice: love yourself, take care of yourself, enrich yourself with the joy of beautiful days and nights, collect the sparks of happiness in your soul. Only then will you notice that people will begin to value your fruits. The more joy you have, the richer you will make this world. Good life is the life that brings the most joy. Why? Because to moan and complain, as correctly observed by the German Emperor Frederick II, means to go against the laws of life: “Those who are not capable of enduring unhappiness, are not worthy of happiness.” Therefore, as British philosopher Willis advised “… be always joyful. Joy is not a path, but your journey will be lighter; it’s not a sack, but it will be easier for you to carry it. There will not be space in your heart or mind for darkness if joy takes its residence there.” “We shall carry beauty with us; otherwise we won’t find it anywhere, even if we wander the whole world in search of it.” wrote Emerson.